Pets and Home Security Systems Can Coexist In Harrisburg PA. If you have a pet or pets as part of your family, you may have wondered if it is possible for you to have a home security system. Many homeowners with pets rule out the possibility of having a home security system believing that pets would disrupt its effectiveness. Fortunately, today’s technology allows you to keep Fluffy and Fido without compromising your home security. Here are a few things that can help you implement the right home security system for all the members of your family. Motion sensors make up one component of home security systems, and one aspect most residents think is impossible to work around if they have indoor pets. There are two ways to manage the problem of motion sensors and pets. The first is to confine the pets to one area of the home where the sensors are not placed. The next is to use pet-immune motion sensors. These sensors use passive infrared technology that only detects a shift in room temperature on living beings above 60 pounds. An enthusiastic dog that likes to jump or scratch against doors or windows can also be a problem if you have window and door sensors. If you have a dog that rushes, scratches or jumps on doors and windows, ask your home security installer about placing the sensors high enough that their movement does not unnecessarily set off a false alarm. Not only is it completely possible to have pets and a security system, having home security can help pet parents keep track of their furry family members using video surveillance systems. Now pet parents can check in whenever they want to tune in to the secret lives of their pets. If r home security system also include home automation, pet parent can use it to make sure the temperature is comfortable for their furry friends or detract from loneliness by simulating presence by turning off and on the television or music in different rooms. Today you do not have to choose between home security and your faithful friend. 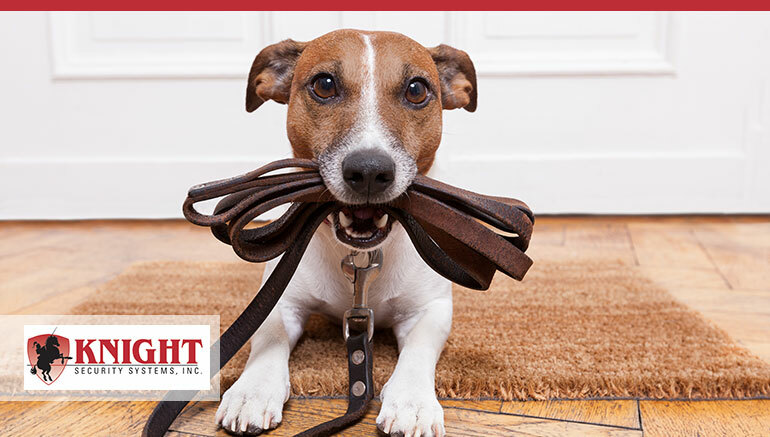 Knight Security has pet-friendly options in home security.